Welcome to the Arts at Overlake! We are a vibrant and active part of the culture at Overlake. Our curriculum is designed to inspire life-long involvement in and appreciation for the arts by providing students with a broad spectrum of classroom and performance opportunities, including drama, stagecraft/technical theater, vocal and instrumental music, traditional and experimental two and three dimensional visual arts courses, digital art making, and design classes. 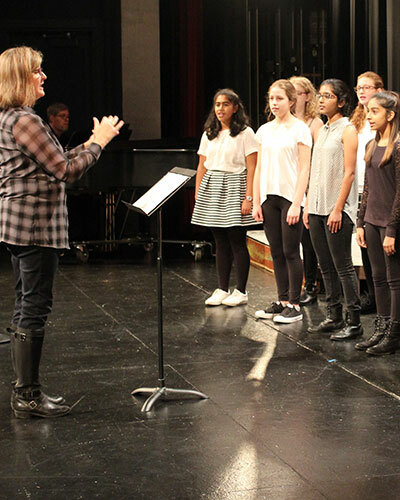 Outside of the classroom, Overlake students participate in the biannual all-school musical, and many perform community and professional arts venues throughout King County. Our arts program helps students build skills in communication, creative thinking, leadership, team-building and self-expression that reach far beyond the stage. We celebrate our student’s creative expression with our school and community, and invite you to join us for all of our plays, concerts, and exhibits. Please visit our calendar for details. See our students in action below. Addition information on our curriculum can be found in the Overlake Curriculum Guide. It's Time for the Annual Mother's Day Flower Basket Sale!